Fast, Intuitive, Order and CRM System for the Promotional Merchandise Industry. To promote this release we are offering a double discount, so get signed up this month! Automatically load customer and enquiry details directly into quotations from your enquiry list. Choose from a quick quote or full e-commerce mode. Securely record customer card details using Stripe. Check all the details and artwork is correct and then charge the card and process the order. Offer multiple quote options in both HTML and PDF emails directly from your website. Easily load products from your site or add your own. Easily upload branded images for that personal touch. View Users on a Google Map and Segment and Tag for Marketing Campaigns. Keep in touch using CRM Tasks. Add your own products to any of our indexes or create your own product groups. Import any range of products you wish to include via Google Sheets. Raise tasks for visuals, to follow up on quotes or orders. Or simply just to keep in touch with clients. View tasks in order or priority and also import cold call lists to work through. Interactive POs – Supplier Notifications – Automated Despatch. Chose from our large range of supported suppliers and easily add or import your own. What Makes ProMart 3.0 Stand Out? Each site is its own entity with its own database and its own resources. It’s not a shared platform. It’s fast and it was designed to be that way. 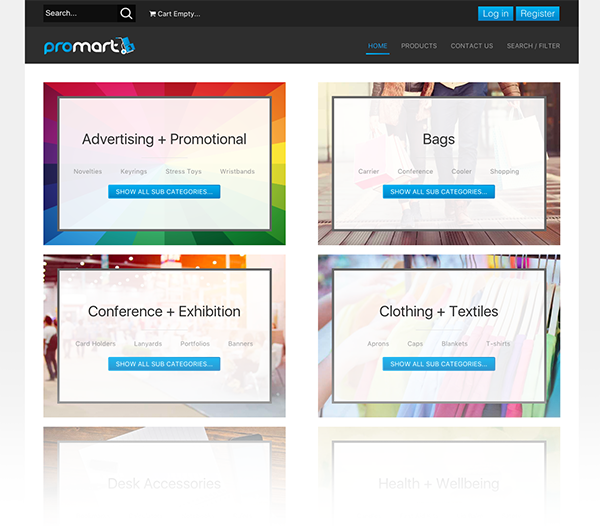 ProMart 3.0 comes with Yootheme Pro and Smart Slider 3 allowing beautiful and easy customisation. ProMart 3.0 is intuitive. The order progress system will save you a huge amount of time. What Makes PromoNet Stand Out? Unlike our competitors, we don’t lock you into a long contract. We work on 90-day terms. We will solve your problems or develop a better solution for your business. Our software has a framework but it’s not off the shelf. We are flexible and will listen to your needs. We add new features on a daily (even hourly) basis. If something is quick and easy to implement you can often see changes made on request in minutes rather than months. What Does ProMart 3.0 Cost?